This fine French violin by Auguste Sébastien Philippe Bernardel (Bernardel Père), is a rare piece of French violin-making history fashioned by the founding father of a dynasty of luthiers, a family that went on to have a major influence on how their craft developed in the late 19th century as partners at the famous atelier Gand & Bernardel. 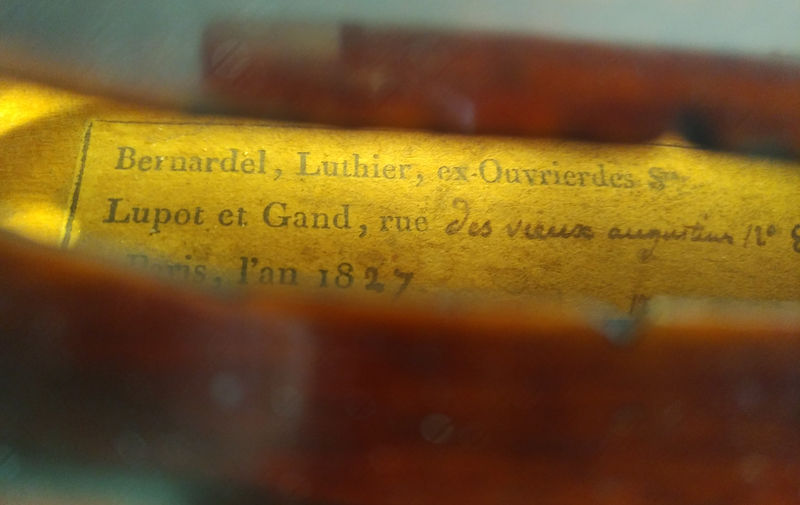 This Auguste Sébastien Philippe Bernardel violin comes with several certificates and it is in excellently restored condition and still features the original label, reflecting the exacting quality standards and flawless artisanry which Bernardel Père learned from his teachers,Nicolas Lupot and Charles-François Gand, and which he later passed along to his sons. Based on a sophisticated Lupot model, here Bernardel Père created a fine masterpiece with an outstanding sound which upholds all of the promises made by Auguste Sébastien Philippe Bernardels delicately crafted aesthetic. The sound holes were carved with exquisite precision, emphasizing the distinctive character of this violin for which Bernardel Père selected top-quality finely-grained spruce and broadly-flamed maple. The reddish-brown varnish over the bright golden base coat shows typical shading, and a beautiful historic patina has formed. The discerningly carved scroll that is blackened in keeping with French style and the perfect craftsmanship of the two-piece back both show the confident hand of its master. Having table restoration to the bassbar and soundpost regions the violin is priced accordingly. The experts at our atelier for restoration have set this Auguste Sébastien Philippe Bernardel up in a manner worthy of its historic standing, and it was magnificently restored it in a way that preserves the large and nuanced sound in the full range of its elegance. Warm and dark in the lower registers, its voice is compelling with sweetness and clarity in the upper ranges. The violin is sold with a certificate of authenticity from the famed Stuttgart expert Hieronymus Köstler, a certificate by Hamma & Co. Stuttgart and a certificate of value for € 50,000 by Christian Lijsen, Munich. This violin deserved teh recommendation of a professional violinist, member of 1st violins of a major Munich professional orchestra.